Additional vocals: Angus Norder and Snowy Shaw. 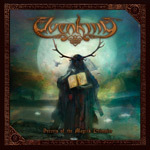 Italian metallers Elvenking put out their ninth studio record and it kind of works as an extension to their last effort, 2014's The Pagan Manifesto, whereas it follows pretty much the same musical direction, just a little more bombastic and epic on a few parts. Their apparent folk metal ingredients with medieval elements and their unmistakable power metal components are still present indeed and fans would definitely not have to worry if they choose to buy a pig in a poke on this one. Even if I can sense a partial return to the older days and the early material too, a lot has happened sonically in the last 16 years since the first album Heathenreel and this brand new stuff comes out so much greater sound quality-wise and therefore any further comparison besides a certain kinship between the records would be just utterly ridiculous. It's still well-spirited music though and the songs are often pretty magnetic and captivating to my ears and I think Secrets Of The Magick Grimoire is yet another solid making by the Italians. I'm not sure how much I can praise this one without coming out too caught up in the moment, but it's absolutely a well enough satisfying product at the end of the day and even if it's maybe not their best work to date it's hands down just as good as its predecessor in my opinion.